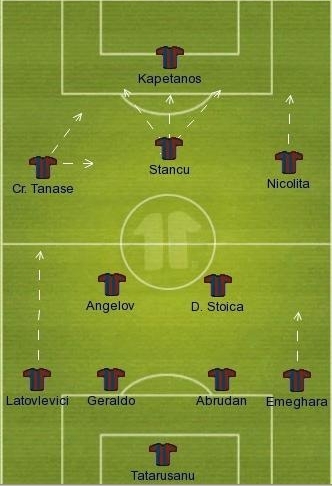 Ilie Dumitrescu’s debut on Steaua’s bench came with two changes in the first eleven, both easy to anticipate. Pantelis Kapetanos, considered a key player by Dumitrescu, was handed his first start of the season, even though the Greek’s performance proved that he’s quite short of match fitness. “Kape” missed three good chances to score, but was the one that suffered the invisible foul inside the box that eventually decided the game and helped a lot during the game with his intelligent movement, creating channels for the excellent Bogdan Stancu, pulled back in a role that hasn’t affected his impressive efficiency from this start of season. Another player to get a first appearance in the red and blue outfit was the Brazilian right back Bonfim, appreciated for his offensive approach, but quite inconsistent in defense. Even though Steaua created lots of chances and was solid enough at the back (Victoria Branesti scored as well from an invented penalty), I expect a few more changes for tomorrow’s game against Grasshoppers Zurich. Let’s not forget that Dumitrescu promised a switch from Piturca’s 4-1-4-1 to his beloved 4-2-3-1 and, slowly, I’m sure that this will take place. If he kept the young attacking midfielder Radut in the team on Monday, allowing him to move up the pitch at will, for security reasons he’ll probably change him with either Pacurar (able to play box-to-box) or hand a debut to the experienced Angelov, known for his defensive ability and versatility since his Bundesliga years. One of them should partner Stoica, in order to protect the back four, a defensive line that could see the Nigerian Emeghara return on the right side, where he didn’t impress this season, but has a better understanding with the rest of the team. These changes should increase the team’s balance and defensive abilty, important things for a coach who wasn’t afraid to send a fifth defender (Gardos) late in the game versus a newly promoted team, in order to secure a narrow, but vital victory. 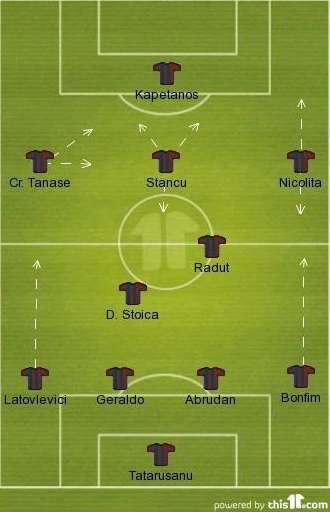 The attacks will rely on Tanase’s skill, who likes to cut inside and make space for the runs from behind of the hard-working Latovlevici, Stancu’s ability to drop into the holes created by Kapetanos, who’s expected to look more confident and dangerous inside the box, ready to speculate the crosses from Nicolita and Latovlevic, as well as inspired in playing one-two’s with either Tanase or Stancu. This should test Sforza’s central defenders to the max, as there’s a combination of pace, technique and aerial threat which relies on a lot of movement and quick passes, unless the Swiss side will be smart enough to defend higher up the pitch and cut off the suply from Dorel Stoica, the man that pulls the strings from a “regista basso” role.